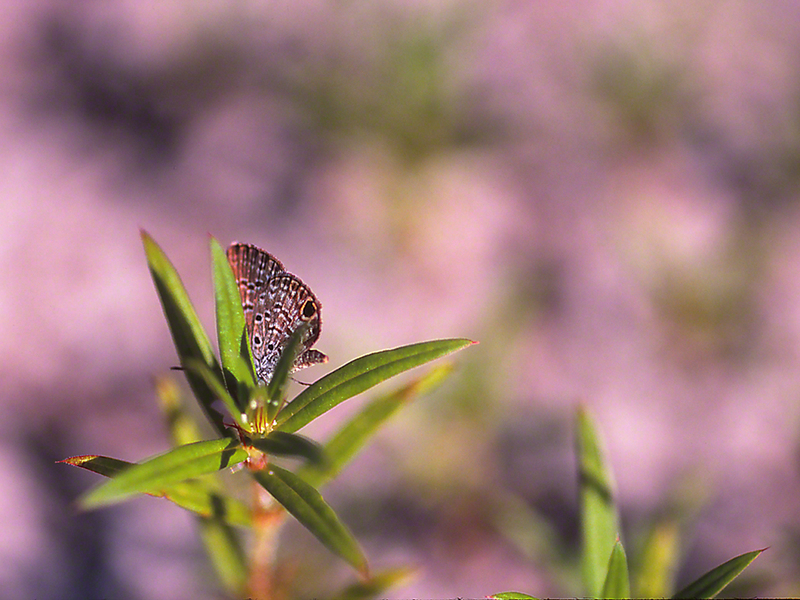 New is exciting, and that’s how I felt when I spotted these tiny Ceraunus blue butterflies. We were in the Spring Creek Unit of Big Bend Wildlife Management Area. This particular Florida Panhandle refuge was proving to be a gold mine, full of butterflies and wildflowers that were new to me. While driving deeper into Spring Creek, I pulled over at a promising spot, discovering sandy low dunes abutting a farm field. Working the semi-trail that skirted the farmland, several species of low-flying butterflies were kicked up by my boots, and among them, some Ceraunus blue butterflies. Jackpot! New to me, ‘though I can’t say that they much shared views of their luscious dorsal blue. I took an immediate liking to these Hemiargus ceraunus. Don’t ask why I share only this particular image, head obscured by foliage. Tiny, yes, and elusive nevertheless. Share I will though, 850 miles from home, hanging out with some very cool little blue butterflies.